"EastEnd Promises started as a 3 peice band from Newham East London who joined forces with Iason Everit last year and are quickly making their way to the top. They are self taught and pride themselves in giving 110% at every performance. 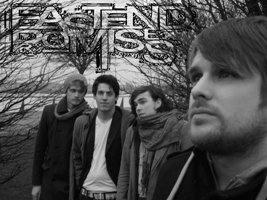 If rock with a twist is what u want, then look no further than EastEnd Promises, a great contrast of hard to mellow, progressive to indie, and energetic to emotional, EastEnd Promises has it all..."
1). What musical instrument is the wildest/most fun to play on (from your point of view)? gibson thunderbird, there aint nothing quite like it it has its own growl. 2). What has been the biggest challenge in your life? trying to work with drunken band mates lol. 3). What song you can listen to again and again? kings of leon pyro, or incubus dig. 4). What is your favorite feature on R&R? 5). If you could ask one question to the leader of your country, what would it be? Why use our tax money on wars we no nothing about.